Did you ever wanted to know what Pokemon are there at any particular location before visiting it? No one loves to waste their time in search of nothing, isn’t it? Most of the time we visit places in search of Pokemons & all we get is some really common Pokemons or nothing. The Pokemon GO app does have in-game tracking which almost useless. But worry no more, you can now know what Pokemons you can find at any selected location. 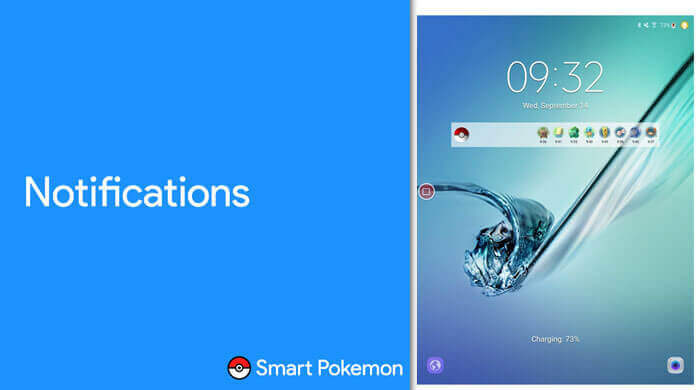 Pokemon Go Smart Poke comes with some really cool features that can help you save lot of time & you can catch some rare Pokemons. It isn’t actually any illegal hack that can help you play Pokemon GO without moving & help you enjoy the game. Pokemon Go Smart Poke shows Pokemon at any particular location in realtime. You can select any location to know what Pokemons you find there. Sounds interesting, isn’t it? The thing that makes this app more special is the notification feature. It notifies you when there’s any Pokemon around you using your device’s GPS location & Pokemon GO’s API. Pokemon scanning: Long click anywhere on the map to start scanning. Click on any pokémon to show its details in the bottom left corner. Name, Rarity, distance (on this screenshot the distance is 75 km because i was not there ) and remaining time. New Menu & Filters: The menu bar at the top allows you to apply different filters and refresh function. 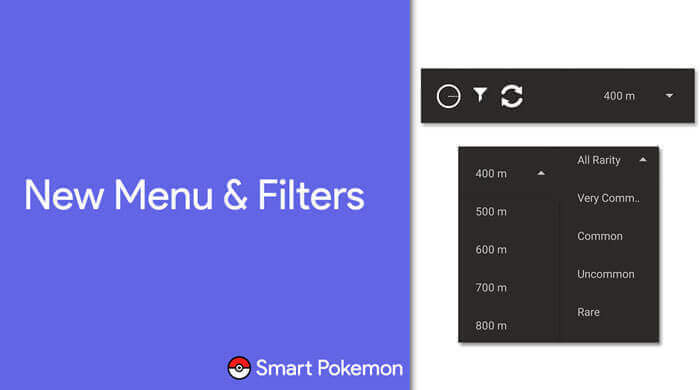 The filter option has two filtering option for tracking Pokemon. The distance filter allows the user to select between 400m to 2000m. The app will detect the surrounding Pokemon near selected location depending on the selected radius. The second filter is rarity filter. The rarity filter ranges from common to Legendary. Refresh button will rescan the area for any new spawned Pokemon. Gym Location Tracking : It allows you to track all near by Gyms at selected location. It can be very helpful when you are at any unknown location & you want to catch some cool pokemons. Gym Status : It is also possible to check gym’s status. Tapping on the gym icon on the map will show the gym status. The gym status shows the details of trainer defending the gym and gym’s level. It also shows the defending team and defending Pokemon. Gym Notifications: You will get notified when your defending Gym gets captured. This function is not inbuilt and requires the user to install Tasker app before installing the Smart Pokemon app. If you have already installed the app and want to use the tasker feature, then you have to uninstall the Smart Pokemon app. Then install the Tasker app and reinstall the Smart Pokemon app. 2. A PTC (Pokemon Trainer Club) account. Remember to use different username and Email-ID for the registration. Using the same information as your Pokemon Go account may create difficulties. For an example, getting a temporary or even permanent ban. Step 1. 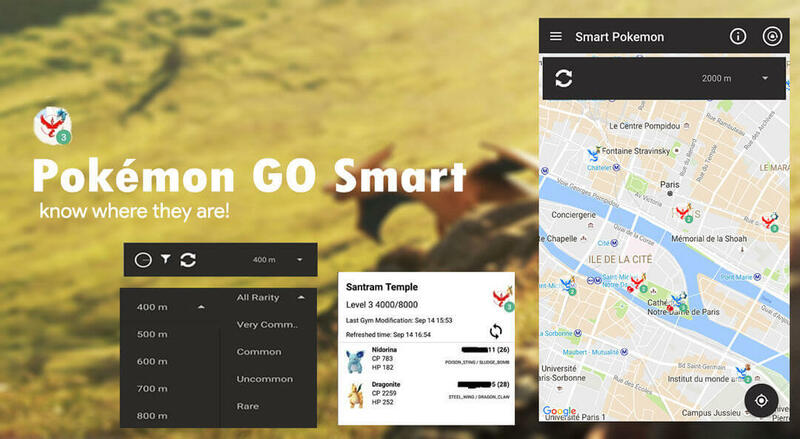 Turn on your device’s GPS & launch Smart Pokemon app. Step 3. Wait for the app to track your current location. If the app fails to do so, just press the GPS icon at the bottom of the app to force detection. Step 4. At the bottom center of the screen, the app will show a percentage indicator displaying current tracking process. Wait till the display hits 100%. 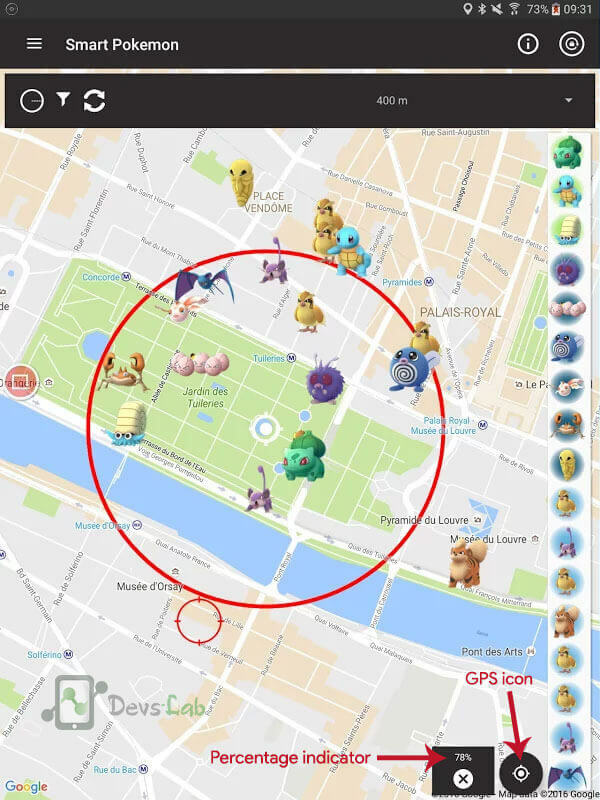 Now you can see the exact location of the Pokemon on the map. Tapping on the Pokemon will show a timer indicating the remaining time before the Pokemon disappears. By adjusting the Auto-refresh option in the settings, you can also get notification of nearby Pokemon while playing the Pokemon Go. 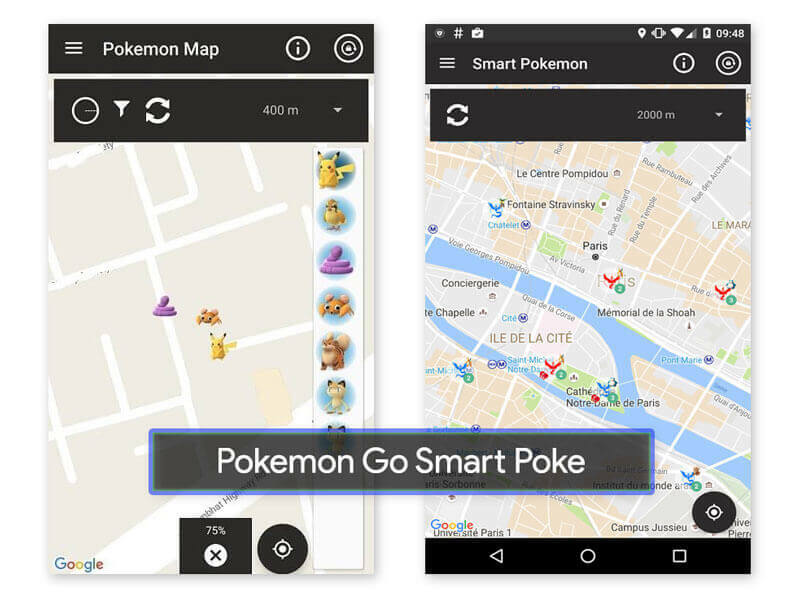 Pokemon GO smart app seems to be one of the best working tool that can help you save your time & energy. Rather travelling miles in search of Pokemons, you can directly jump to that location. Well, I don’t think it violates any of the rules & seems to be a very safe tool to use on the go! We would like to thank Cyril Preiss (SWApps) for this awesome creation. Let us know your experience with this awesome tool in the comment section below.